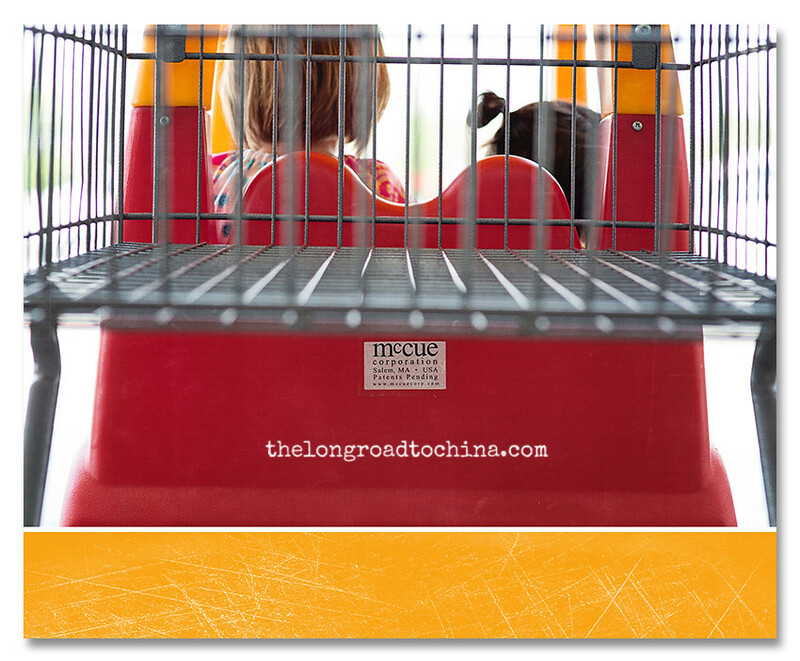 The Long Road to China: Sunday Snapshot - "Adventures in Grocery Shopping"
Sunday Snapshot - "Adventures in Grocery Shopping"
After yesterday's trip to the Berry Farm, we had to make a quick stop at the grocery store before heading home. When we got to the front of the store Sarah was disappointed to see that there weren't any "Car Shopping Carts" available. One of the young employees overheard her and he offered to check all the collection areas in the parking lot. Within minutes, he appeared with a car shopping cart fit for two! He totally made Sarah's day! And that big beautiful smile appeared!! There were lots of giggles coming from the front of the cart and they caused quite a stir as we made our way up and down the aisles. Usually, I do not take my camera to the grocery store but I happened to have it with me because of our trip to the strawberry farm. When I saw the look on the girls faces in that car, I knew the camera was going to come out of my bag. The very first aisle we hit in the store was completely empty so I acted quickly. That top photo was totally caught in the moment and makes me laugh every time I look at it! I also love how the seat between the two girls almost resembles a heart. All photos in this series were processed with a touch of Florabella's Classic Color and then they were laid out using her new Color Matte and Design Kit. And just for fun, I applied a radial blur to the top photo to give the illusion of motion. Kind of looks like the cart is toppling over, doesn't it? Make sure you swing by Stef's blog and check out everyone's super Sunday Snapshots. Such FUN pictures!!!! LOVE them all!!! I love that radical blur in the first photo - simply awesome. I took over 100 photos fishing with Amelia yesterday and none of them are that sharp. I know it's not just the camera, but MAN those are unbelievable! Your pictures are always SO incredible. 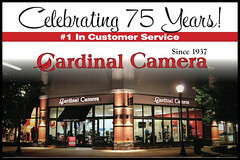 :) And you have a Canon 5D? So jealous. 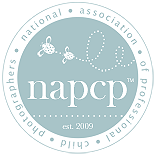 My husband and I have been positively drooling over them the past few days...but I think my budget will only allow a 7d, when the time comes. :) Anyway...like I said, your pictures are always SO FANTASTIC!!!!! That first photo is amazing! I don't think that I have ever seen anything like it. LOVE! Can you do a tutorial on how exactly you got the tunnel look on the first one. That is awesome! I will work on it.... it is really not that difficult! Fabulous, fun photos...and the FIRST one is amazing, Lisa!!! Love them all and also love the color. the first shot is fantastic! How do you push those heavy carts though? Happy Sunday... Love the photos and the those carts are tooo cute... Love the photos like always.. the girls are toooo cute. Oh my, I love this series! The first picture is so cool ... you may need to fill us in on how you did that :)! 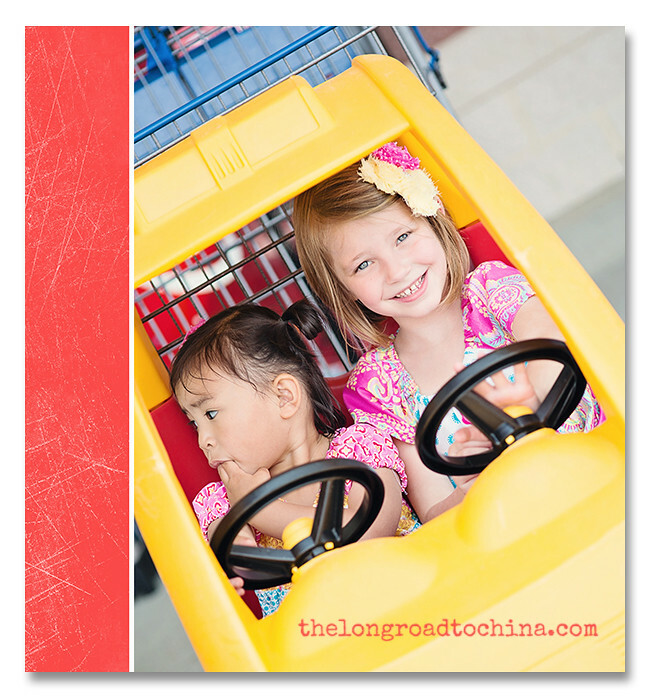 The girls are darling ... oh the fun that can be had at the grocery store in those car carts. I think the top shot is a prizewinner. How "fun"tastic! I love the first shot with the heart seat and motion. LOVE these, Lisa! Your girls look so happy, and what fun that it's just an ordinary trip to the grocery that's making them smile so :) Beautiful! 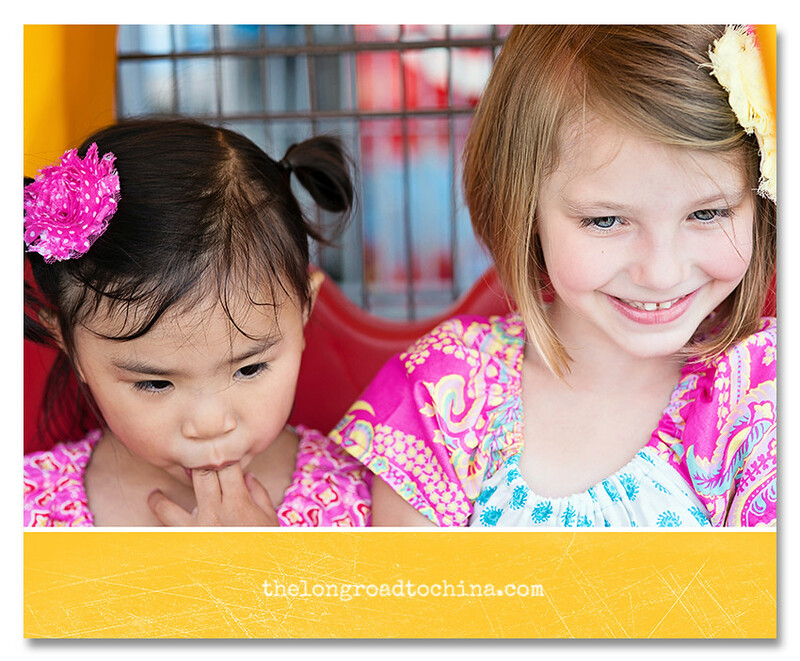 LOVE the joy that radiates from these...I can almost hear the giggles and laughter! So glad you had your camera and took time to capture the moment. These are priceless Lisa! Love the movement of the top photo! Beautiful pictures, and the first picture is simply fantastic!! Great, great photos Lisa! It's so fun to document seemingly mundane events such as grocery shopping, because these are just the things we don't want to forget. Love that first photo too...the radical blur is so fun! These are the cutest grocery store pictures I have ever seen! I especially love the first picture! Thoe are the cutest pictures of the girls. you are such a great photographer. I am Dawn's on our little china girl/Ciao Bella's mom. 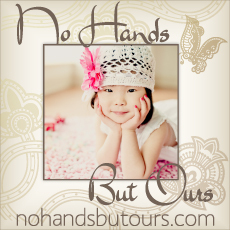 I follow your blog all the time and just love seeing the photo's of all the children. Thank you for sharing I know how LONG you waited for your precious little one. You have a beautiful family and I really enjoy your blog. Wow!! 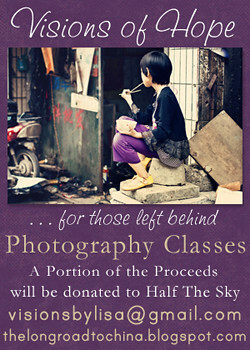 The photos are all so fun and beautiful but that first....so very cool and fun!!!! Hope you are having a fun Memorial Day...just back and can't wait to catch up with the group! We don't have grocery carts like that here, they're brilliant. I can imagine that kids love grocery shopping in this! I think the first photo looks as though they're in a tunnell. 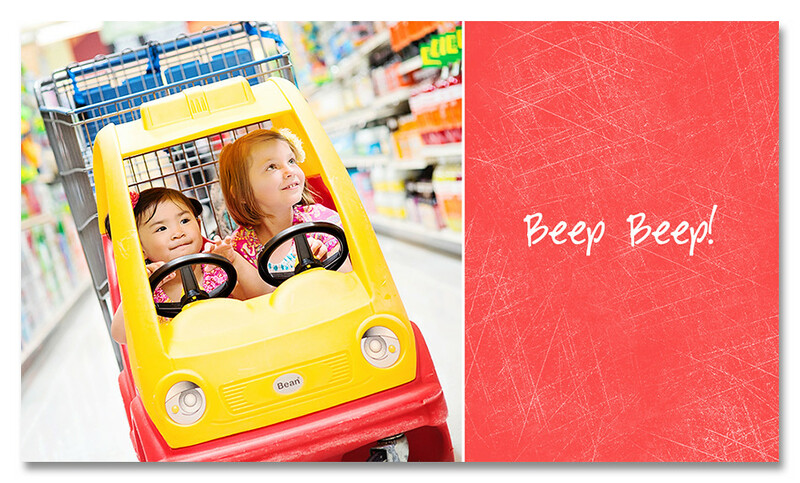 Love the Beep Beep one too! You literally ROCKED this grocery store trip!!!! I just love that first photo. It is so COOL!!!!!!!! These are such great shots! I love what you did with the first pic; very cool! Your girls are just so cute! What a way to top off a perfect day and make a chore totally delightful. These are the moments we will remember. Hope your Memorial Day week-end was all fun like this. What fun!! 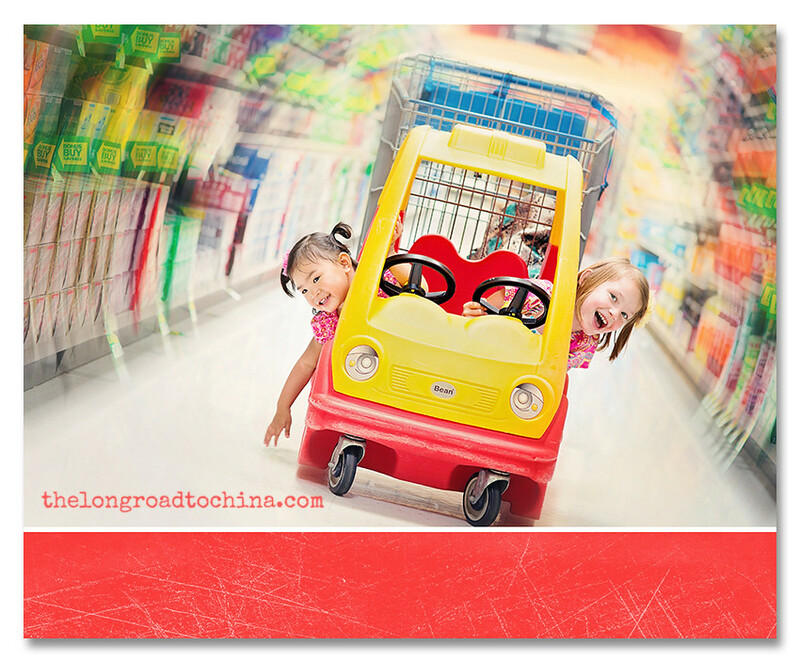 Love these photos of your girls -- who knew you could have such a good time at the grocery store! 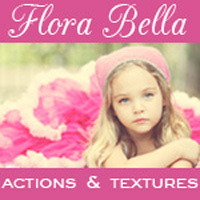 I am starting to use Florabellas new actions too and just love them!! Another great post! These are SO FUN!!!!!!!!!!!! Seriously- just when I think you can't wow me anymore than you already do..... you go & do a post like this. I have told you before- but I will say it again, you inspire me in so many ways. Thank you!! HOW.DO.YOU.DO.THIS?!!! Love the special effects!!! This is absolutely the neatest thing I've seen!! LOVE IT!! *U will notice, that now...the "mixture" will start to feel a little heavy, that's "normal", keep "pushing"
*after 20mins of "steering", your mixture will start to slowly become impossible to maneauver. *at this point, be mindful of the NARROW AISLES, THE CUTESY DISPLAYS and oh yeah that customer who's is bent over in the aisle way and their rearend is practically consuming the aisle or the "deserted" basket that some "nice" customer abandoned to quickly grab some olives, two aisles over. Keeping pushing....your "fine"
*Your "cake" is just about done (and literally...so are YOU). Now happily and wearily steer it towards the checkout counter, where now ALL the candy is at the eye level of "said kids". *Proceed to pull each one from underneath with squeals of protest and request to "ride one more time". *If you feel the need to inwardly curse the makers of this "parent trap" again...PLEASE DO SO!!! This will not "change" the recipe...ahem...it only gives it a "little more flavor"
*Before leaving the checkout counter, you will now "toss in the final ingredient". Yes..you will now toss in the item from the "greeting card" aisle. Place the SYMPATHY CARD inside the basket for the next Mommy for surely she will need it. Like "us" Southerners say "Bless her heart"
Didnt realize I hit ANONYMOUS on the above comment!! LOL!!! Yep it's crazy old me SNEKCIP!! I love these, Lisa, truly LOVE them. Most of all I love that little Reags pulled those fingers out of her mouth and BEAMED. Lisa, just when I think I seen it all on your blog you surprise us this this series. Delightful! I could have sworn that I commented on these. Truly, they made me smile HUGE. Love the colours and the papers you used, and those two girlies in that top picture, I don't think I've ever seen anything quite that adorable in the supermarket! We definitely need these carts in Canada!